David recently completed a Medical Science degree at the University of Queensland. As an anatomy demonstrator and an undergraduate representative on the Academic Board, David is heavily involved in education at the university. He carries ambitions for surgical, pathological and anatomical research. As a recent Bachelor of Science graduate from the University of Queensland, Gareth received the Robert Kennedy Prize in Anatomy in 2007. He has since worked as an anatomy demonstrator in a variety of undergraduate anatomy courses and has a personal interest in anatomical dissection. In 2009, Ashwarya graduated from The University of Queensland with a Bachelor of Science (Biomedical and Anatomical Sciences). He has previously held several tutoring positions for first year organic chemistry, human biology and microbiology. He has now made the transition to medicine in Canberra. 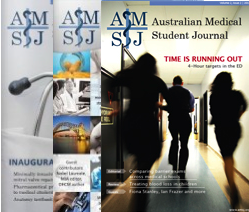 The study of anatomy is often a challenging endeavour for many medical students. Central to the learning process is the use of a good textbook. 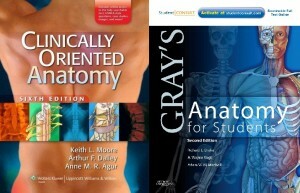 Two of the most often recommended texts for medical students are Gray’s Anatomy for Students (GAS), descended from the iconic text by Henry Gray, and Clinically Oriented Anatomy (COA), by Moore, Dalley and Agur. Both texts employ a regional approach to the study of anatomy. GAS separates each chapter into four sections: Conceptual Overview, Regional Anatomy, Surface Anatomy and Clinical Cases. The conceptual overview aims to provide the very basic concepts of each region in a concise summary before moving on to an increasingly detailed description. While this approach may be useful for the beginner or reviewer, the inevitable repetition creates a degree of redundancy. COA presents information in a ‘bones up’ format, progressively adding surrounding structures before detailing the arthrology of each region. Each chapter concludes with a series of radiographic images to complement integration and understanding. Certain striking distinctions are evident in the textual quality of each book. GAS aims to strip away irrelevant information into an easy-to-read summation while leaving intricate details for other texts. While this provides an excellent introduction for the neophyte, COA includes more rigorous explanations concerning the finer points and the complex interaction with surrounding structures. An enlightening example of the differing styles can be observed through the treatment attributed to the sternocleidomastoid (SCM) muscle. A concise, tabular description of muscular attachments, innervations and basic function is provided in GAS in association with a stylised diagram indicating its position in the neck. Conversely, COA devotes an entire four page sub-section to a detailed discussion of the manner in which body position and the use of synergist muscle groups can alter function of the SCM beyond an isolated view of the muscle acting independently in the anatomical position. Thus, while simplified to enhance the initial integration of basic concepts, GAS may simultaneously perpetuate certain erroneous notions concerning the nature of anatomical function. On the other hand, the text in COA may reduce its effectiveness for the uninitiated, while GAS may prove to be too simplistic for the interested student. Both books approach diagrammatical representation through the use of computer-generated imagery, though distinct dissimilarities are visible. COA depicts each region by incorporating detailed and realistic diagrams which are thoroughly labelled. In contrast, GAS represents analogous images through a distinctly stylised fashion. Major structures are portrayed in an idealistic mode, which, in combination with relatively sparse labelling, may impede practical application, particularly in medical courses focussed on anatomical dissections. However the simplified overview, devoid of extensive detail, is potentially easier to comprehend for the less experienced anatomist. In addition to detailed, accurate labels, COA consolidates diagrammatic elements through representations in various anatomical planes. The depiction of distinct layers within each system aids the appreciation of the detailed nature of such structures. Ultimately, COA associates these illustrative characteristics through the use of numerous, detailed figures within each specified anatomical region. The use of COA may prove to be beneficial, both in dissection and in providing a broader scope of understanding. Drake R, Vogl W, Mitchell A. Gray’s Anatomy for Students. London: Churchill Livingstone; 2009. Moore KL, Dalley AF, Agur AMR. Clinically Oriented Anatomy, Sixth Edition. Baltimore: Lippincott Williams & Wilkins; 2009.